The lower sash is a Tilt 'n' Turn window. 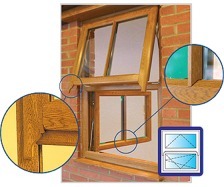 The top of the sash can be tilted slightly inwards for ventilation but it can also be turned 90° inwards for cleaning and, dependent upon size and position, be used for emergency escape. 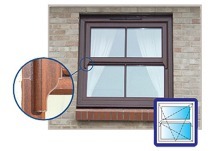 This window was designed specifically for the householder who wanted top over fixed with RunThru horns, but actually had to have a ‘fire escape’ window. 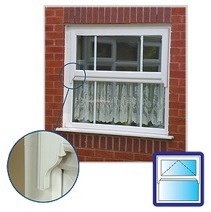 To match the top over fixed windows a Tilt 'n' Turn sash is fitted with a dummy sash with horns. The result is a window that has ventilation under normal circumstances and the escape facility if the worst should happen. foils are Mahogany, Golden Oak or Rosewood.